Gender is irrelevant. Species: Borg. 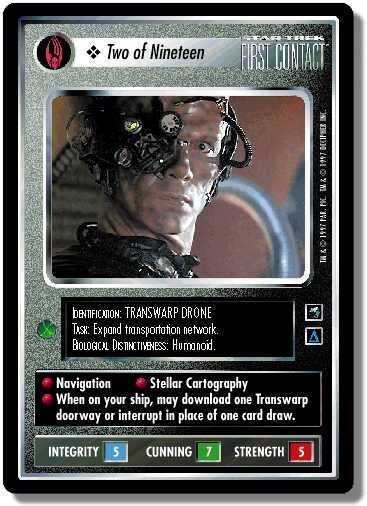 Navigation Stellar Cartography When on your ship, may download one Transwarp doorway or interrupt in place of one card draw. Characteristics: affiliation, Drone, Borg species. This personnel may download one doorway or interrupt whose title includes “Transwarp,” i.e., Transwarp Network Gateway (doorway) or Transwarp Conduit (interrupt). Taken form Glossary - Version 1.9.5. There are 25 entries for Two of Nineteen (ST1E 4 C 92) at the Tradeplace (80 haves and 1 wants). Click here to see all trade list entries for this Common card! Also see here for all trade lists with any card fom "First Contact".